Specialties Needed: GS, OBG, PD, FP/IM, AN, U, EM,ORS, PS,PD ORS, PD SURG, Oral & Maxillofacial Surgeon, OPH, Dentist. 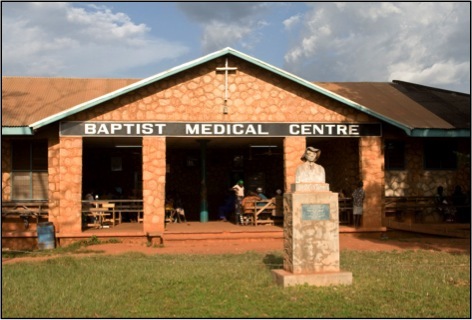 Location: Baptist Medical Centre is located in the town of Nalerigu in rural northwest Ghana. Profile: There are approximately 10 hospital buildings and seven medical wards including medical, OB/GYN, surgical, ICU, pediatric, isolation, and TB. It is a 137 bed facility: (50) pediatric, (21) surgical, (23) medical, (14) isolation, (11) adolescent, (8) maternity, (5) HIV/TB, and (5) staff/special care. There is currently no ER, but the hospital is open 24 hours a day to receive emergency cases. Approximately 400 patients are seen each clinic day (MWF). There is also a mobile dental clinic, staffed by Ghanaians, doing primarily extractions and cleanings three days per week and administrative work two days per week. Expatriate staff includes (1) U.S. boarded FP physician and (1) U.S. boarded OBG. The CRNA is Ghanaian. Surgery: There are (2) major operating rooms and (2) minor operating rooms. On MWF (clinic days), minor operations are performed on those admitted. Elective surgeries are performed on TTH and emergency surgeries as needed 24/7. On average, 1,200 major surgeries and 2,500 to 3,000 minor surgeries are performed each year. There is no portable X-ray available in the operating room. Anesthesia: Spinal, Ketamine, propofol, and local (lidocaine, marciane, etc.). The only anesthesia machine is an old EMO machine. Monitoring equipment is available. Radiology/Ultrasound: Basic X-ray. X-ray technicians take the X-rays, and physicians read the results. Ultrasound machine with linear array, phased-array, and vaginal probes. No CT or MRI capability. Pathology: No lab on site. Common diseases: TB, snakebite, malaria, typhoid, arthritis, and hypertension. Lab tests: Malaria, CBC, Hepatitis A & B, HIV, and urinalysis. Other tests such as ESR, RA, blood type and cross, electrolytes, AST, TSH, and fasting blood sugar are available, depending on reagent availability. Lab tests are only ordered on patients admitted to the hospital. Teaching: Opportunities for teaching by short-term volunteers are limited. Travel/Orientation: Fly into the capital city of Accra. The following morning, fly to Tamale and then drive two hours to Nalerigu. Orientation includes staff introductions, a hospital tour, and a copy of the formulary. Language: While English is the official national language, the majority of the people living around the hospital speak Mampruli. Charting: English. Translators are available for patient interaction. Time Difference: +5 hours Daylight Savings Time (EST), U.S.A.; +4 hours Eastern Standard Time, U.S.A. Climate: The rainy season is April through August. The harmattan, a dry desert wind, blows from December through February. The average annual temperature is 79 F.
Housing: Housing options include several houses and a central guesthouse. The guesthouse has five bedrooms and four bathrooms with hot, running water. Some bedrooms have air conditioning. Washers and dryers are available. Food: Lunch and dinner are cooked for volunteers. Breakfast items are available in the kitchen. Meals include basic American and Ghanaian foods.